In this section of my tour of my websites, I will look at Bootstrap. 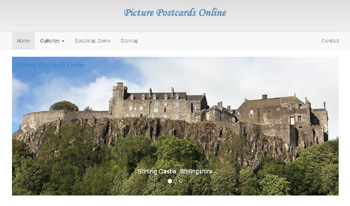 I have used Bootstrap to create Picture Postcards Online, a small project website website. The pages of this Guided Tour have also been created with Bootstrap. Bootstrap is an open-source front-end responsive web development framework. I built the original version of Picture Postcards Online in 2005, as a project while on a web development module at the University Of Paisley. It was hand-coded with XHTML, and featured a prototype guestbook and search engine built with PHP and MySQL. I went on to develop these features in my other websites. I have now decided to update Picture Postcards Online, and re-build it with the Bootstrap framework. Responsive. The layout of Bootstrap web pages adjusts automatically, taking into account the screen size of the device used (desktop, tablet, mobile phone). Stylesheets. Bootstrap includes stylesheets that provide basic styles for all key HTML components. These provide a uniform, modern appearance for formatting text, tables and form elements. Re-usable Components. Bootstrap includes many commonly used interface elements, implemented as CSS classes. Examples include buttons, tabs, labels, thumbnails and navigation. 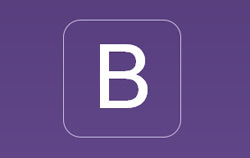 Bootstrap uses a responsive grid system for web page layout. The grid can have up to twelve columns on large screen sizes. This is the 3-column grid of the footer area, viewed on a wide-screen device such as a desktop. The three columns are side by side. This is the same 3-column grid, viewed on a narrow-screen device such as a mobile. The three columns have automatically re-arranged, and are now stacked on top of each other. When the columns are stacked in this way on a mobile device, the user can easily scroll up and down, making the information easier to read. Horizontal scrolling is not required. Static Top. This navbar is always at the top of the page, and disappears from view when the user scrolls down the page. Fixed Top. This navbar is fixed to the top of the browser window. It remains visible when the user scrolls up or down the page. Fixed Bottom. This navbar is fixed to the bottom of the browser window. It remains visible when the user scrolls up or down the page. Inverted. This navbar has an inverted colour scheme. On a wide-screen device, the navbar at the top of each page is the full width page of the page, with the links arranged horizontally. On a narrow-screen device, the navbar has automatically collapsed. All that remains is a small grey rectangle with three horizontal lines: this is the navbar symbol. Clicking on the navbar symbol opens up the navbar. The links are now stacked vertically, which is ideal for mobile devices. No horizontal scrolling is required to view the navbar links. On Picture Postcards Online, I have included a demonstration of some of the other features of Bootstrap. It includes Dynamic Tabs, Accordion, Collapsible Panel, Collapsible List Group, Panels with Contextual Classes, Popovers, Tooltips, Modal, Google Map and Embedded YouTube Video. In the next section of the tour, I will look at WordPress.